I read Olive Oatman’s 1857 biography for research and included a lot of the old-fashioned words I found there which hopefully makes the story stand out a bit. I’ve got to say I loved working with editor John M. Olsen. His suggestions certainly improved the story overall. Swarms of mechanical locusts descend on Deseret, destroying farms in the process. 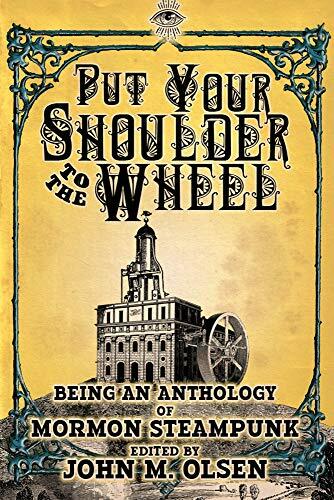 Thomas Durant, the man who is building the new railroad, is only too happy to buy up these now worthless patches of land when a mysterious figure named Olive Oatman arrives in town, fresh off the zeppelin. She’s searching for her long lost brother, but where has she been for the last five years? Why does she keep her face covered? What other secrets is she hiding? Will she be the one who can finally stop the locusts? I haven’t read it yet (except for my own story, of course), but the story I’m most looking forward to based on the title alone is “Dame Ginny McLaserbeam and the Dastardly Duke” by Judith and Michael Collings. If I’m not mistaken, the titular character, Dame Ginny McLaserbeam, made an appearance in Michaelbrent Collings’ book The Longest Con. This anthology should be a lot of fun. Be sure to check it out.